I recall my first contact with Volvo was back in the early 70’s. My father brought one home on a test drive, we were in the market for a new car and dad tried out a Volvo 144, a Toyota Crown and a Valiant Ranger Wagon. He knew what he wanted but couldn’t afford either the Volvo or the Toyota so we got stuck with the Valiant, which of course broke down regularly and started rusting away at 3 months of age. There’s nothing like Valiant quality when you’re washing the car and the water pressure from the hose goes through the tailgate! I distinctly remember my dad writing to Chrysler on just about a weekly basis, needless to say we never bought a Valiant again. Dad changed to Toyota and that’s where he stayed. I never forgot the Volvo and particularly the electric antenna and that little flashing seat belt light! I was so impressed at that early age by the build and safety of the Volvo. So much so that I sought out and began an apprenticeship as a Motor Mechanic at an Esso service station that specialised in European cars. And you guessed it Volvo’s were a common feature of my training. This is when I first started driving and I got to drive many prestige and beautiful cars, Jaguar, Mercedes, Porsche, Saab, Pug’s, Alfa’s and of course Volvo’s to name a few. When I went to TAFE I was the odd one out as all my fellow students were working on Fords, Holden’s and Japanese Cars. Little did I know that the experience I was gaining was years ahead of my peers as they worked on the older technology (bar a few Japanese units) and I worked with progressive European Engineering. I still remember my boss letting me take his XJ6 into a workshop day and during a test drive we’d go over a rail crossing, the Jag didn’t skip or even feel the bumps. The same crossing tossed, jerked and clunked a Ford or Holden, and my peers were stunned! At the completion of my apprenticeship I moved to Cairns in Far North Queensland where I gained a job straight away working on a fleet of 75 Mini Mokes aka Morris/Leyland Mini’s. This is where I learned ‘Anger Management’! I changed jobs (Mechanics do this a lot) and worked for Alfa Romeo for several years, gaining an insight through factory training into the skills and demeanour required to work on factory stuff. They had me work side by side with an Italian Mechanic; luckily he spoke some English, as my Italian was restricted to Pizza! Alfa was a good experience where I had the chance to consolidate my skills while meeting some motoring personalities such as Colin Bond (racing Alfa’s in Bathurst at the time) and Peter Wherrett (host of ABC Torque Program). The Alfa Workshop was positioned directly under the Cairns Airport flightpath and so my interest in Aircraft was gained. This resulted in a change of career when I joined the RAAF. There I specialised in the Gas Turbine engines of the F111 Fighter Bombers. I got married and started a family and this is when I bought my first Volvo, the safety factor influenced my decision and I bought an 82 Model 245GL Wagon with 50k. I was transferred to Amberley in Southern Queensland where also I operated a little workshop on the side, fixing cars for friends and dabbling in the odd collectible, such as a HT Holden, 65 Cortina and VW Beetle. From the Wagon I moved to a 1980 265GLE Californian sedan (which let me down due to it’s Renault V6 engine), then a 1979 244GL Sedan, onto a 1987 760GLE (More V6 problems…damn Renault!) then onto a 1982 244GL Sedan. You may have guessed by now that V6’s didn’t impress me and the European Union engine exchange program dulled my impression of Renault. But every 4 Cylinder Volvo engine was and is a gem, along with the car a masterpiece of engineering. Another change of career beckoned when the RAAF consolidated its maintenance and my job was sold off to a civilian company. I accepted an offer from the Queensland Police and soon found myself back in Far North Queensland working with remote communities in the Gulf of Carpentaria. I did 14 years service with some experience riding Police Motorcycles (escorting Bill Clinton) and working Highway Patrol. It’s this experience where I got a very good appreciation of what is safe and what isn’t as far as motor vehicles go. The old EH while a tough car, isn’t very flexible when crashed and occupants aren’t wearing seat belts…but I won’t go there in this story. Suffice to say that my confidence around anything European was reinforced. One of my bosses soon discovered my mechanical aptitude and alas I found myself performing the duties of a Transport Inspector and Superintendent of Traffic. Testing of Bush Mechanics for driver licences and inspecting their vehicles for rego. At this point I had gained qualifications as an A Grade Mechanic and full membership of the IAME (Institute of Automotive Mechanical Engineers). The funny part about this experience is that when the REAL Transport Inspectors came to town I would be inundated with locals registering their vehicles (for only 3 months) and turning up to get their licences renewed (mostly expired) while the Travelling Enforcement Circus (as I called it) was in town. Why didn’t I enforce? Rule Number 1: Bush Police Officers live and work in the community and you don’t make enemies of the locals, it’s part of community policing. You only bring out the ‘Big Stick’ when it’s needed. But, lets get back to the Volvo. Sticking to my 4 cylinder criteria I progressed to a 240GL 7 Seat Wagon with 4 Speed overdrive and then 1971-144S Manual De-Luxe Sedan (a project car for my son who soon rejected it when he got his licence for a Nissan 4WD). When promotion beckoned I transferred to Southern Queensland Toowoomba and I joined the Queensland Volvo Club and started to make friends in Volvo circles, I enjoyed the field days, working on our cars and the camaraderie of sharing knowledge and experience. This proved to be financially beneficial too as a good network of Volvo parts suppliers was utilised to keep the cars in tiptop condition. My Volvo 4-cylinder commitment was tested when a fellow club member who was also a mad Jaguar fan decided to rationalise his collection. I had sold the 144S and now only had my daily driver, the 240GL Wagon. We got to discuss his cars and so I was invited around to his home to inspect what was on offer, particularly his Volvo collection (he had several). When I pulled up in the drive I stopped behind a White 164E Sedan. I was immediately taken by this car and looked it over thoroughly, admiring its originality. The fellow Volvo club member then went into the history of the car, how it was originally from Melbourne but he bought from a Victorian Volvo Club member and drove it up from Melbourne. How it been a relatively unreliable car costing him a lot of money, immediately pulling out a folder full of history and receipts for every conceivable maintenance item. I looked over all the problems and noted that some of them were very minor or were due to misdiagnosis, an example was the constant tune ups they had carried out, I inspected some of the fuel injection wiring and noted that corrosion and deterioration of the connectors (common due to poor insulation plastics I suspect were Italian or French). The car only had 105 thousand miles, so had little mileage for its age. 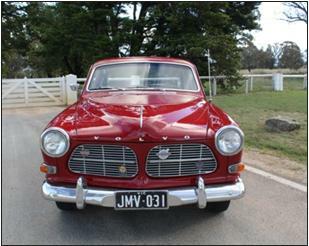 It was the first model fuel injected Volvo brought into Australia and is top of the range with leather, auto, air conditioning, four wheel disc brakes, seat belts all round, power steering and the list goes on. Alas he was fed up with it, so I saw this as a good opportunity to buy within my budget. I asked the price and for $1000 we exchanged signatures. I also got a boot load of new and used parts. Now $1000 may sound a lot for a 60’s shaped Volvo but the locking fuel cap it had was worth at least $100 (I had sold one previously on Ebay) so I figured that worst case scenario I could strip it and sell it off if it got too much. This hasn’t happened and I have rebuilt the brakes, and fixed the tuning with a full replacement of the injection wiring, connectors and serviced fuel injectors. I also ensure that the fuel is regularly replaced or used up, requiring a weekly or sometimes twice weekly run in my garage (good time to sit in my car, have a beer and listen to the footy live on ABC!). The car runs smooth as silk and the engine is pure Volvo, yes it’s a 6cyl but the same 6cyl fitted to the Penta Marine Range so a proven unit. In Europe these engines are turbo’d without having to reinforce too much and a visit to You Tube will demonstrate how tough this engine is (touch the fake wood dash). The car was waiting for registration when my wife and I moved our family to Canberra. Another career change for both of us! And my only concern with the move? What transport company could move my car without damaging it! How relieved I was when it arrived in one piece. Thus my Queensland affiliation has ceased and now I begin to continue the story in the Canberra. My research soon discovered that no Volvo Club could be found in Canberra (apparently closed several years ago and absorbed by the NSW club). However with luck I found the CACMC website and fired off an email to discover that this club had some six Volvo members. No other club in Canberra could boast that number so my choice of club was clear. Now I’m a CACMC member and looking forward to gaining and sharing my knowledge and experience with other like-minded motoring enthusiasts. Eventually I could be persuaded to upgrade my 164E to a 122 Amazon Estate or Sedan and that could be another story.